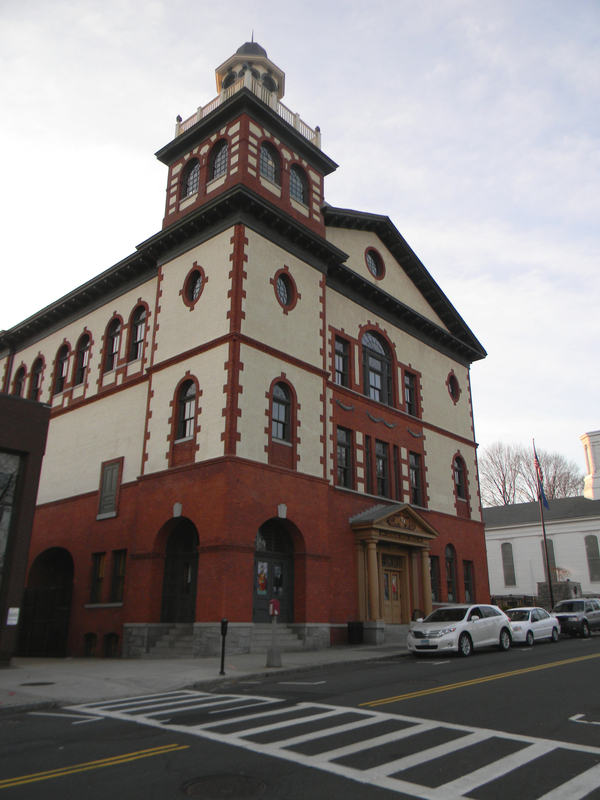 It didn’t surprise me that the Sterling Opera House in Derby, Connecticut, was haunted. Since opening in 1889, the massive Italianate Victorian theater has hosted many famous guests, including Lionel Barrymore, Harry Houdini, Red Skelton, and Amelia Earhart. It has also functioned as a town hall, with a police substation, complete with six jail cells. When I was invited to investigate at the opera house with Creepy Places of New England and Rise-up Paranormal, I jumped at the chance. I had the opportunity to tour the building last year when NE POST conducted a paranormal investigation, but I wasn’t able to stay for the investigation due to scheduling conflicts. Getting a second chance seemed like destiny. It was a night I won’t soon forget. According to Rich DiCarlo, the Chairman of the Derby Cultural Commission, the title “opera house” was a generic term for a theater. “This was a vaudeville and burlesque house more than an opera house. You saw jokes and dancing girls here,” he said during our tour of the building. The theater closed in 1945 and became the town hall until the mid-1960’s. During that time period, there were three confirmed deaths, two heart attacks and a suicide in the jail cell, after a man consumed rat poison, but oddly enough, none of those souls haunt the building. We started the evening with a full tour of the building. Although the outside of the building was renovated, the interior remains the same as it did when it closed in 1945. 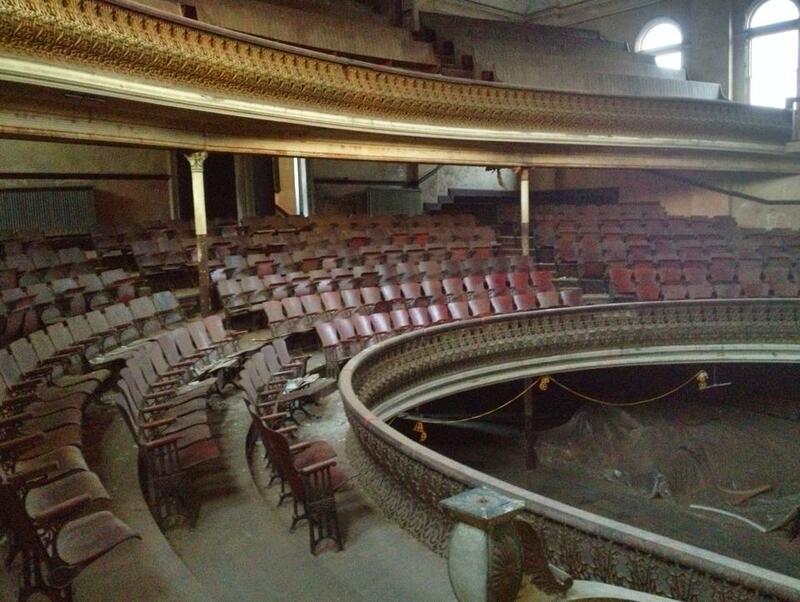 The theater seating is still in place, covered in decades of dust. When you stand on the massive stage and look out at the audience seating, compete with two tiers, you feel as though you traveled back in time. Typical of the era, the best seats were on the bottom floor, most of which have been removed. The second tier offered slightly lesser seats, while the third tier seats were only six inches wide. Servants sat at the back of the third tier on folding chairs. The Lady in White is frequently seen on the second tier balcony, sitting to the right of the second column. No one knows who she was. Although she’s periodically seen, she refuses to provide any clues to her identity. Was she a fan of the theater? Or was she a lovelorn patron, drawn to the building to watch the man she loved perform? No one knows for certain. 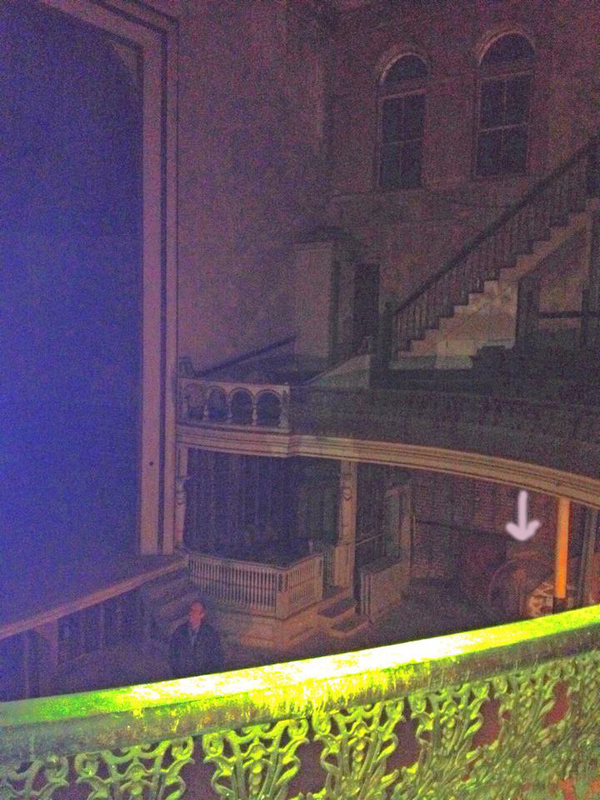 Another entity known to haunt the building is the Lady in Green. We know that she was a woman from Brooklyn named Heddy and was in charge of the female troop of dancers. Although she didn’t die in the building, she must have returned after her death, preferring it to a peaceful afterlife somewhere else. According to Rich, she often follows investigators down to the jail cells, warning them to be careful. Andy is another entity who haunts the building. No one knows his story, since there isn’t a documented child’s death in the building or surrounding area, but he has made his presence known to many investigators. He often responds on EVPs, singing and talking. He also enjoys rolling a ball on the stage. A mysterious stagehand is also seen in the building. No one has recorded his voice on audio, but he’s been witnessed on occasion, wearing an ill-fitting brown suit. As the room grew darker, I snapped a photo of the stage area. After lightening it, one of my eagle-eyed friends commented on the mysterious man in the photo. While there is a real live investigator in the photo, there does appear to be another person there who wasn’t part of the investigation. It’s possible it’s just pareidolia, the human knack for finding faces in random objects, but I’m not ruling it out without further on-site analysis. 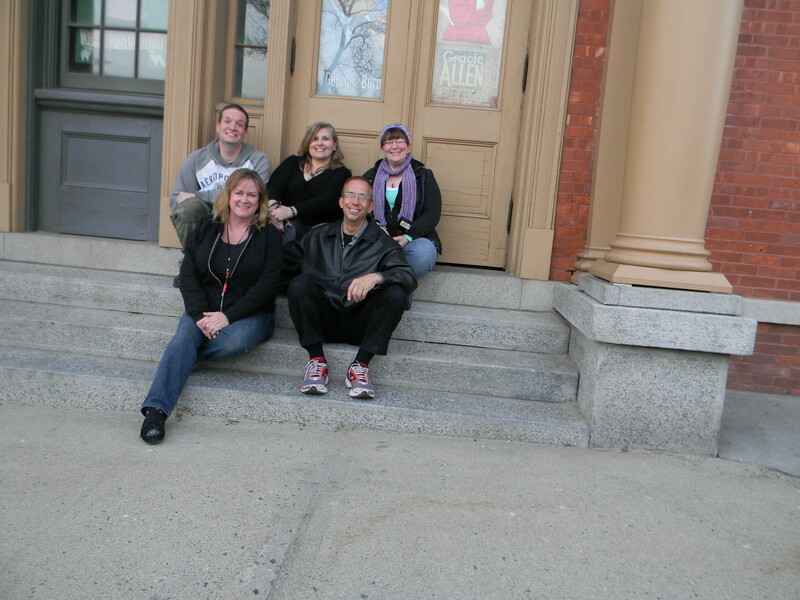 Our group consisted of members from Creepy Places of New England, who also maintain a video blog. Founders, Steven Moreau and Charles Reis, were joined by fellow teammates, Heidi Neuschuez and Cynthia Mattison. Joining us from RiseUp Paranormal was Tara Melendez. 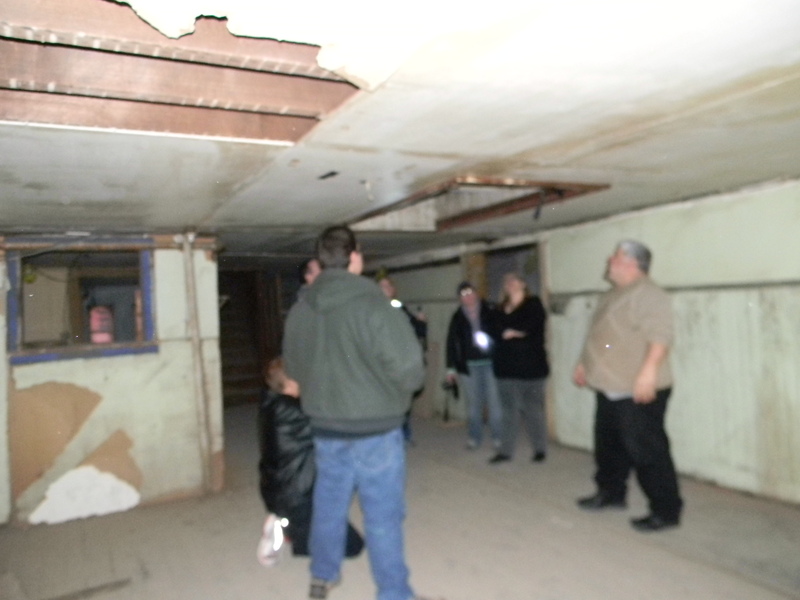 We conducted our first EVP session as a group on the stage. Halfway through the session, I began hearing a tone. Being clairaudient, I hear a sound similar to ear ringing when a ghost is nearby. I followed the sound to the wings of the stage, where I sat down for a moment. The ringing grew louder, as if something was coming closer to me. I just happened to look up in time to see a white mist drift over my head. I was stunned. I’m not the sort of person who often sees ghosts during investigations. In fact, this was only my second time out of more than 200 investigations to see something. I didn’t have time to photograph it before it was gone, but it left a lasting impression. I moved back to where the group sat. Heidi pulled out her dousing rods, something I’ve always found intriguing. As she asked questions, she began getting very distinct responses. We learned that the Lady in Green was with us, as well as Andy the boy. After a few minutes, we decided to use my SB-7 Spirit Box to see if we could capture any verbal responses. The Spirit Box scans quickly through the radio stations, allowing the ghosts to use the white noise to generate speech. I don’t post them unless they scan through several channels and are appropriate responses, ruling out stray radio voices. This one scanned through at least four channels. You can click on the links below to hear the recorded responses. The next one was compelling because the old police station once used the end of the stage as a shooting range. There are bullet holes on the wall. Shortly after we captured this, we heard a siren go past the building, making it even more appropriate. We then ventured down a flight of stairs to the area under the stage. The area is divided into two sections: the dressing areas for performers and the old town hall offices. We were drawn to two distinct rooms: the Junkie’s Room and the Casting Office. The first room we investigated was referred to as the Junkie’s Room by fellow investigators. While the building sat abandoned, derelicts often broke in and used the rooms as shooting galleries. Tara Melendez has investigated at the opera house dozens of times and said that a man was found there passed out from a drug overdose. She felt that he was a twenty-seven year-old male, telling us that her group often gets “crazy responses” in there. The room had a decided heavy feeling. As we stood there, asking questions, we became aware of a tapping sound. It seemed to correspond with our questions. “Is that you tapping?” one of the investigators asked, and was rewarded with another tap. I asked if he could tap once for “yes” and twice for “no,” and received two taps in response. We decided to continue anyway. I also captured an EVP, which I didn’t realize until later when I reviewed my audio recording. We then headed to the Casting Office. Our first few questions revolved around what happened on the casting couch. We weren’t really expecting an answer. After the heaviness of the Junkie’s Room, we needed to lighten the moment. Apparently, the ghost in residence found our humor amusing. He said “woo” in the middle of a question, something we all heard at the time, making it a disembodied voice. I left shortly afterwards for my two hour drive back home, but the experience will remain with me for a long time. 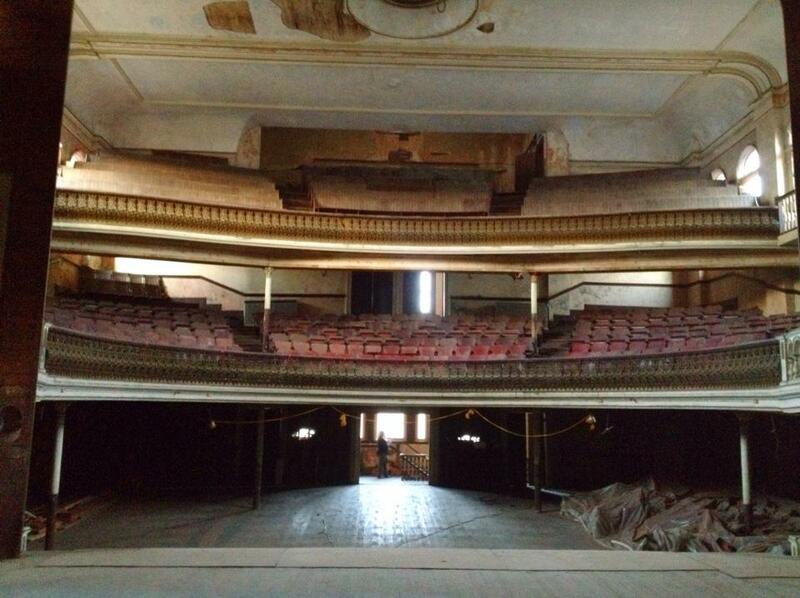 If you’re looking for ghosts, the Sterling Opera House is the place to go. The building is full of them and they are eager to communicate. 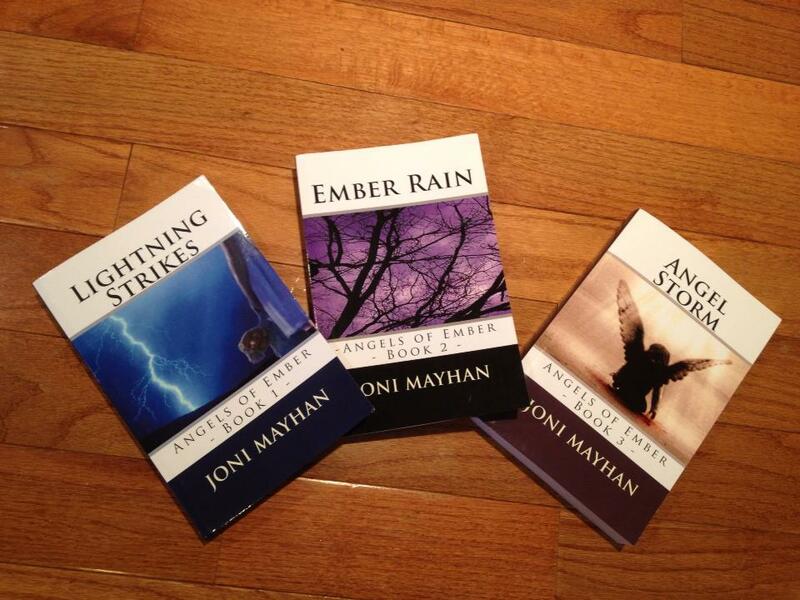 This entry was posted in Night Thoughts, Paranormal and tagged Creepy Places of New England, EVP, ghost hunting, ghost hunting; Haunted Victorian Mansion; spirit attachment; paranormal, Joni Mayhan, Just Joni, Mediumship, SB-7 Spirit Box, Sterling Opera House; Paranormal Investigation; Lady in Green; Lady in White by jonimayhan. Bookmark the permalink. Joni, you have encapsulated the night exactly as it happened. I believe the spirits also responded because of the positive energy between all the investigators. Several times we asked questions (some off the wall) and other investigators responded with “we on the same wave” or “I was just about to ask that.” Great sound bites also. It was a pleasure meeting and working with you, we must get together again. Fondly, Steve Moreau.